we have two type frying machine for choice, continuous frying machine and round pan frying machine with automatic discharging. 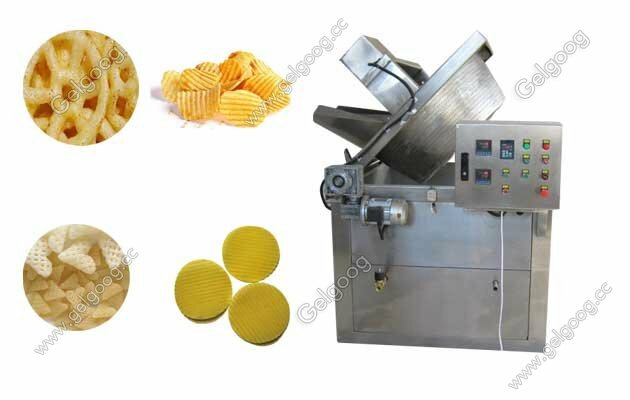 Automatic Pellt Chips Frying Machine|Pellet Fryer For Snack Food and Potato Chips For peelt fryer machine, we have two type frying machine for choice, continuous frying machine and round pan frying machine with automatic discharging. This automatic continuous fryer is equipped with automatic lifting system, automatic oil removal system, automatic conveying and cooling system. 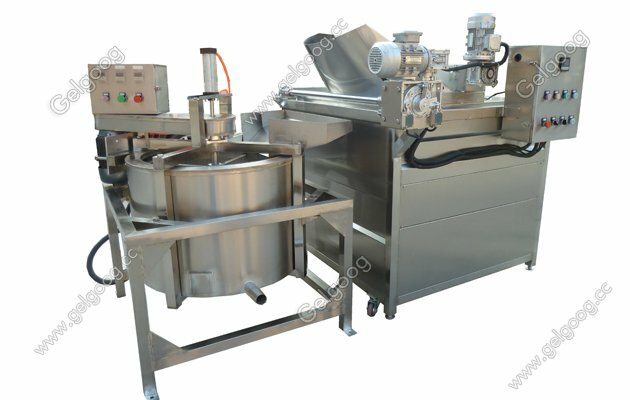 The machine can automatically finish frying, mixing, deoiling and conveying. The heating mode of the fryer can be powered by electricity, gas and firewood. 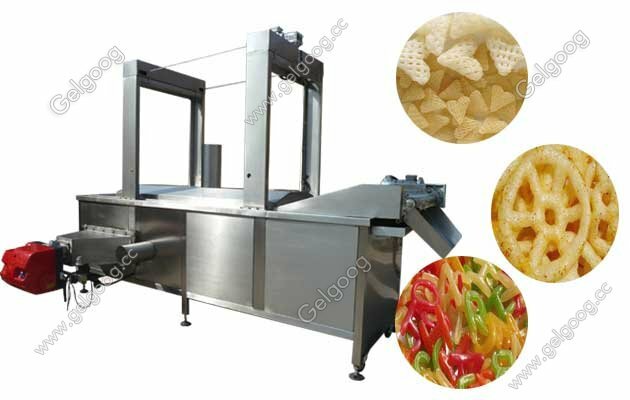 This machine can be widely used in the frying of snacks, granules, chips, sticks, beans, nuts, peanuts and so on. 1: the structure of the fryer is compact, lifting, deoiling, transporting and cooling. 2: the use of PLC control to achieve full automatic work. 3: imported gas, the diesel burner ensures the best power consumption and higher efficiency. 5: double 304/316 stainless steel belt to prevent the product floating, to ensure complete, perfect frying effect. 6: the scraper is fixed on the belt so that the product can be easily removed. 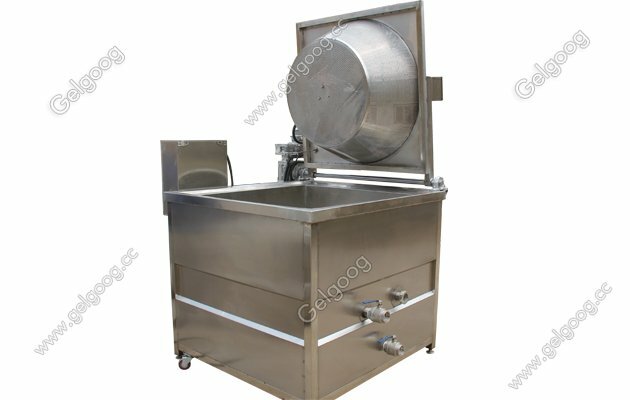 Round pan fryer with automatic discharging. 1. the main body of the machine is SUS304 stainless steel. 2. a mixed mode of rotation and rotation to ensure the uniform frying of food. In the case of food bonding, the mixing system makes frequency conversion because of extrusion. 3. automatic unloading system can reduce the labor intensity of the workers, ensure the consistency of the food during the frying time, and improve the quality of the products. Note: the special size can be produced according to the customer's demand. 4. machine can be made into gas heating and electric heating. For gas heating, it is necessary to add burners and gas pipes. Therefore, the cost and size of the gas model will be greater. 5, mixing function can help you stir the frying material well, especially vegetables, fruit slices and other floating materials. The agitator can be pressed into the oil through the rotation of the axle and the flap valve, so as to save labor and beautiful fried food. The agitator can be rotated around the pot. 6, the discharge part is designed to be slot type to help the material to deliver the material smoothly and correctly. 7, the operation button, we will put it in your language, convenient operation. 8, if the fryer is made into a gas heating type. The burner adopts the Italy brand, and each part is important for the whole machine. Leave your inquiry on our website or contact us freely, if you have any problem. We will feedback soon try our best.